The R/V Sally Ride, a Neil Armstrong-class AGOR ship, is the U.S. Navy's first research vessel named after a woman. It is named after the late Sally Ride, first American woman in space. The United States Navy's first academic research ship to be named for a woman will be christened after NASA's first female astronaut to fly in space. Secretary of the Navy Ray Mabus announced Friday (April 12) the next ocean-class auxiliary general oceanographic research (AGOR) ship will be named the R/V Sally Ride. "As secretary of the Navy, I have the great privilege of naming ships that will represent America with distinction as part of the fleet for many decades to come," Mabus said in a statement revealing the names of seven ships, including the Sally Ride. "These ships were all named to recognize the hard working people from cities all around our country who have contributed in so many ways to our Navy and Marine Corps team." Mabus named the future R/V Sally Ride in memory of the astronaut, who also served as a professor, scientist and innovator at the Scripps Institution of Oceanography at the University of California in San Diego. Scripps will operate the R/V Sally Ride when it enters the Navy's fleet in 2015. Ride, 65, died on July 23, 2012, to pancreatic cancer. She made history when she lifted off with the STS-7 crew on space shuttle Challenger in 1983. The first U.S. female astronaut to fly into space, she was only the third woman worldwide to reach orbit, following two Soviet cosmonauts, Valentina Tereshkova in 1963 and Svetlana Savitskaya in 1982. After her second launch on the shuttle, Ride left NASA to become a physics professor and a champion for improving science education. She founded her own company, Sally Ride Science, to pursue her passion for motivating girls and young women to pursue careers in science, math and technology. "Sally Ride's career was one of firsts and will inspire generations to come," Mabus said. "I named R/V Sally Ride to honor a great researcher, but also to encourage generations of students to continue exploring, discovering and reaching for the stars." Traditionally, AGORs are named for nationally recognized leaders in exploration and science. In September 2012, Mabus named the first of the Navy's new class of modern AGOR ships the R/V Neil Armstrong after the first man to walk on the moon, who died a month after Ride. The first U.S. woman in space, Sally Ride, monitors control panels from the pilot's chair on the Flight Deck of the STS-7 mission. According to the Navy, the Sally Ride will include acoustic equipment capable of mapping the deepest parts of the oceans and modular laboratories to provide the flexibility and capability to meet a wide variety of research activities conducted by academic institutions and laboratories. The R/V Sally Ride, which will be a Neil Armstrong-class AGOR ship, will be the U.S. Navy's 28th auxiliary general oceanographic research ship. The research vessel will be 238 feet long (72.5 meters), have a beam length of 50 feet (15 meters) and will be able to operate at more than 12 knots. 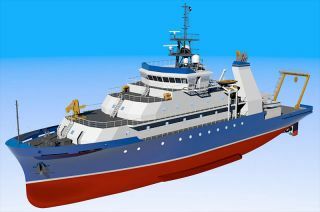 The R/V Sally Ride will be built by Dakota Creek Industries in Anacortes, Wash. In addition to the Ride and Armstrong, the Navy has three other ships named after U.S. astronauts. The USNS Alan Shepard, named after the first American in space, was launched in 2006; the USNS Wally Schirra, named after the only pilot to fly Mercury, Gemini and Apollo capsules, was launched in 2009; and the USNS John Glenn, named for the first American to orbit the Earth, is scheduled to be delivered to the Navy in 2014.